How do I put this one into words for my review?! It was gooooooood. A goooood novel. Not high literature, but damn it all I enjoyed it a lot. Exciting. It starts with great historical details of life in Paris during WW2, then the excitement builds and builds and builds. Parts are gruesome, but the ending left a big smile on my face. Yeah, tons of fun. But I have to tell you this: the narration of the audiobok was t-e-r-r-i-b-l-e…..by Mark Bramhall. I mean his French and German dialects were laughable. And you are not supposed to be laughing. He cannot do women’s voices either. I mean bad. OK, when he is just relating straight events, not dialogs, you can relax. The thing is, the terrible narration did NOT affect my appreciation of the book. I make a huge effort to distinguish between the writing and the narration of a book. Good book, but lousy narration. As usual, I am rating the book, not the narration when I give those stars. There is humor. There are historical details. 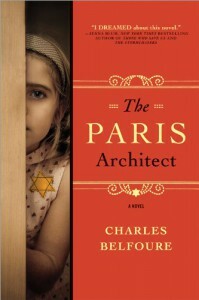 The book captures the French and how they looked upon the Nazi occupation of Paris. Some French were no angels. Collaborators and those of the Résistance, they are both here. Very realistic. Some women were great and others despicable. Some French were great and some Germans too! :0) Yes, you get architecture too. Classical and Bauhaus and ….oh you have to read this fun, exciting, scary and amusing book. I loved, absolutely loved the ending. It is a novel! I do not want to tell you more than that. Otherwise I might spoil your reading experience.